Aided by a politically correct culture of “tolerance”, the Muslim Brotherhood (MB) is secretly building a “parallel” society in Sweden by infiltrating organisations and political parties, a government report has concluded. Surprisingly, the document takes aim at “political elites” for fostering a doctrine of multiculturalism and silence, which can help and facilitate the nefarious ends of anti-democratic organisation like the Brotherhood. Somewhat predictably, however, the publication of such claims in Sweden – where open criticism of liberal, multicultural ideals is rare – has caused a row, with critics labelling the report “conspiratorial” and claiming it misrepresents Islam. 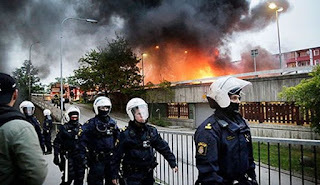 Published Friday, the document was commissioned by Sweden’s Civil Contingencies Agency (MSB), part of the country’s Ministry of Defence, which is responsible for civil protection and public safety. The paper’s authors claim the Brotherhood is working to increase the number of practicing Muslims in Sweden, encouraging tension with Secular society, and targeting political parties, NGOs, academic institutions and other civil society organisations. They also slam the “established structure of values among the country’s political elite [which] places a high value on ‘acceptance’ and ‘tolerance’ of citizens who are in some sense different from the mainstream”. In the report, the Islamism of the MB is described as a totalitarian political ideology born out of Islam, a religion. This can make it “difficult to oppose what on the surface appears to be (a vulnerable minority) religious rights”, it explains. Critics, therefore, “run the risk of being called ‘racist’ or ‘Islamophobic’ and because of the situation in Swedish society such classifications endanger people’s careers”. The press was quick to label these claims inflammatory, and 22 academics and “experts” in religion have published a blog post questioning the methodology of the research. The academics – from many of Sweden’s leading universities – say it is “almost conspiratorial” to suggest criticism of Islamism is difficult in Sweden. They also insist the claim that the Brotherhood is building a parallel society is refuted in past research. Controversially in Sweden, the report also links Islamism and poor social integration to immigration. “Islamists aim to build a parallel social structure competing with the rest of the Swedish society the values of its citizens. In this sense, MB’s activists pose a long-term challenge in terms of the country’s social cohesion”, it states.